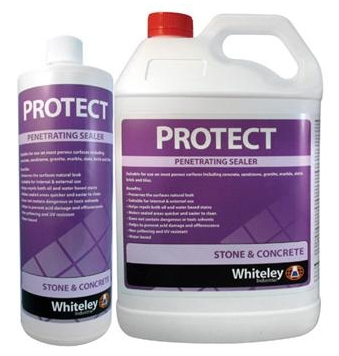 Protect Penetrating Sealer is suitable for use on most porous surfaces including concrete, sandstone, granite, marble, slate, brick and tiles. 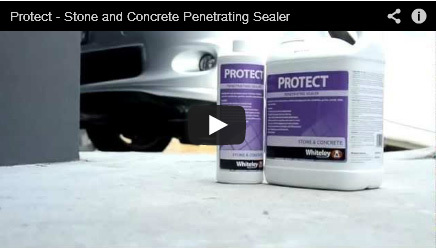 Protect Penetrating Sealer protects surfaces against staining and makes sealed areas easier and quicker to clean. It maintains the natural appearance of the sealed surface. Protect Penetrating Sealer is UV resistant and suitable for both indoor and outdoor applications. It is easy to apply to surfaces and requires minimal labour. Test in a small inconspicuous area to determine suitability for the intended use. Surface should be clean, dry and free from any waxes, coatings or finishes. PROTECT any painted or stained surfaces adjacent to application area. Apply to surface with brush, roller or garden type sprayer. Remove any remaining sealer that has not penetrated the surface after 10 minutes. A minimum of two coats is recommended, although additional coats may be required on porous surfaces or heavy walkway areas to ensure sufficient PROTECTion. Allow 30 mins drying between coats (longer in humid or cold conditions). It is highly recommended that the treated surface be kept clean and free of soils for at least 24 hours to allow optimal curing. For cleaning of external areas, use a garden hose with a pressure nozzle. High pressure cleaning is not recommended. For cleaning of internal areas, simply mop or wipe with a soft cloth and a mild detergent. Do not use harsh cleaning agents such as abrasive powders, ammonia, acids, solvents or bleach. Providing proper maintenance is provided, PROTECT Penetrating Sealer will PROTECT treated surfaces for many years. Under certain high wear conditions, such as heavy walkways, the surface should be tested periodically and additional sealer applied if necessary. Protect - October 2012, 2 ABN 1 Litre will cover approximately 20m2 per coat depending upon the material to be treated and method of application. There is no way of predicting an individual’s response to cleaning or disinfecting products. All cleaning and disinfecting products have a potential to cause skin and other irritation in susceptible individuals. Direct physical contact with the skin should be avoided. If irritation does occur when using this product or any other cleaning/disinfecting solution then the individual should be removed from direct contact with the solution until a satisfactory safe working environment for that individual is determined. Whiteley Corporation manufactures products that comply with Australian and International environmental policy. Whiteley Corporation aims to ensure that every product is 100% biodegradable, whilst achieving optimal performance and benefit to customers. All Whiteley Corporation products are supplied in 100% recyclable containers. Whiteley Corporation and its staff are fully committed to ensuring that our Australian environment and those international environs in which our products are used are enhanced by the use of technology, and that these environments are preserved for the enjoyment of future generations.